To me It is of greater need that we have a tool in which one can store and connect the various digital artefacts belonging to one project or domain not splitt across various applicaions but all together in one digital context. I want to draw and label the associations between topics which I have in my mind. My hope is that DeepaMehta will enable us to share those individually structured topics and associations - our knowledge - with each other - jointly and in a peer-to-peer manner. DeepaMehta is a software platform for knowledge workers. The special feature of DeepaMehta is the situation-centered user interface: information belonging to one working context is -- together with its meaningful relationships -- displayed and edited in a single window. Whether it is text, images, documents, emails, web pages, events or for example contacts. DeepaMehta represents information contexts as a network of relationships. This graphical representation exploits the cognitive benefits of mind maps and concept maps. Visual maps -- in DeepaMehta called Topic Maps -- support the user's process of thinking, learning, remembering and generating ideas. We think that working with DeepaMehta stimulates creativity and increases productivity. DeepaMehta can be used as a single user application or collaboratively with others. 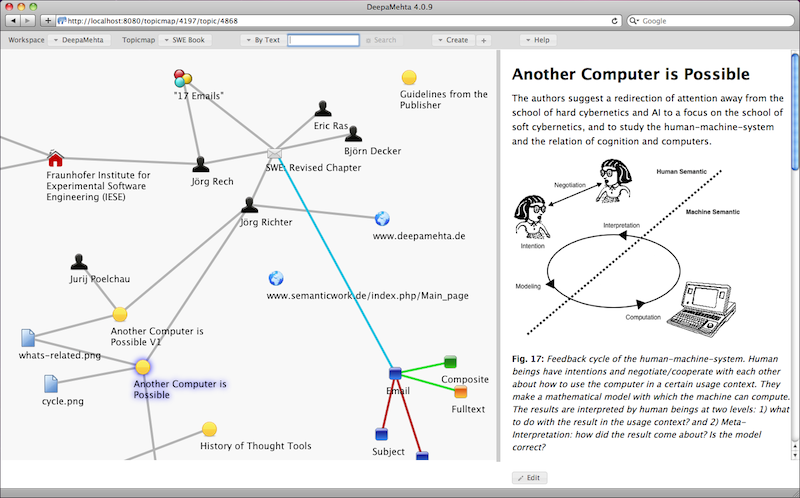 Topic Maps can be made accessible to the public. DeepaMehta is a thought tool. DeepaMehta is a post-desktop-metaphor user interface for large displays. DeepaMehta is an open source project. The software is licensed under GNU General Public License, version 3. The name DeepaMehta is inspired by the Indian movie director Deepa Mehta. The conventional desktop user interface is application-centered: Information is linked to applications (instead of situations). This leads to an unnatural fragmentation of the work situation. The DeepaMehta vision is the gradual replacement of the application-centered user interface. You can learn more about the DeepaMehta concept. What considerations have been incorporated into the DeepaMehta design? What is the concept we have of information, knowledge and learning? What are the advantages of mind maps and concept maps? Where exactly we see the problem of the traditional desktop user interface and how DeepaMehta solves it? You can download the DeepaMehta software (see above) and use it. The installation is very simple: unpack the archive and run the start script. The only requirement is that Java is installed on your computer. DeepaMehta changes nothing on your system settings and can be uninstalled easily and without residue. For further installation instructions see the README (included in the download as well).